Living in Townsville, most of us are familiar with the importance of preparing for the upcoming cyclone season. Knowing how to prepare is one thing, but knowing how to correctly dispose of waste during your preparations is another. What are some of the things that should be considered? Tidying your yard in preparation for summer bbq’s and outdoor entertaining for the warmer months can be fun. 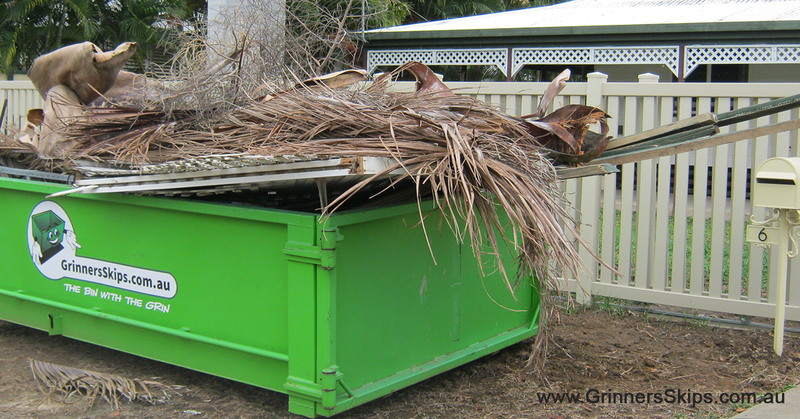 However, it’s just as important to remove excess waste from your outdoor space to prepare for the risk of a cyclone. Avoid having unsecured items around your yard and make sure the area is as safe and risk-free as possible. Remove all things such as unwanted planks of wood or tools and equipment from unfinished renovation projects. Finish them or pack them away! If you’re unsure what to do with excess materials and waste, GrinnersSkips can help. We’re Townsville’s best value for money when it comes to skip bin hire and we can deliver a waste removal service right to your door. Knuckle down for a weekend and clear your yard. Getting the hard work done now means you’ll be making your home and yard safe for yourself and your family. Preparing for a cyclone includes cutting back overhanging branches and overgrown hedges, shrubs and bushes. Clearing leaves and debris from gutters and downpipes will also make your house as safe as possible. We’re the experts in waste management and we can assist you with the best methods of waste removal according to your needs. Hiring a skip bin makes the job easy. Load up your waste and let us take it away!